When it comes to muffins I prefer simple and pure flavours more than complex concoctions. I typically don't enjoy more than one or two flavours at anyone time. Part of the reason is that for me a muffin is for breakfast and not a dessert, so it should be simple like breakfast. 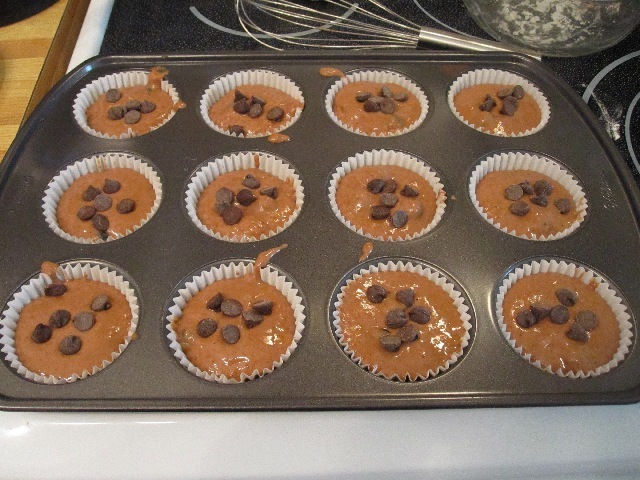 This also means that I typically avoid any sweet additions to my muffins, like chocolate. But on this particular weekend (full disclosure: this weekend was about four weeks ago) I really had a craving for chocolate, but didn't necessarily want cake unless it was a cupcake, and I didn't feel like making cupcakes because of the frosting obligation (or looks of disappointment when I mention there is no frosting). However it occurred to me that all this could be resolved with chocolate muffins. And as it just so happened I had some leftover blueberries in the fridge, making chocolate blueberry muffins not only a possibility but a sure thing. As with many times before I decided to replace the butter with applesauce, wanting a little more of a low fat offering. 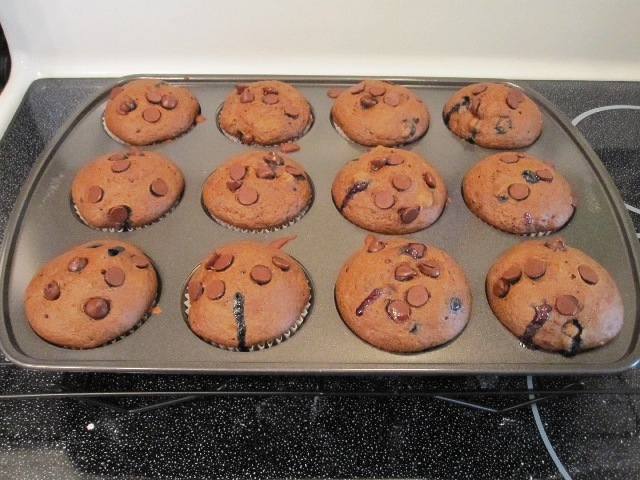 I had previously decided against adding the chocolate chips (mostly because of the annoyance of uneven distribution), but at the eleventh hour I had a change of heart and added six chocolate chips to the top of each muffin; a delicious little chocolate crown (of even distribution :)). You know when you're excited about something, and you build it up in your head that it's going to be great, and you imagine that a low fat blueberry chocolate chip chocolate muffin is going to be fantastic and then with much anticipation you take your first bite and a feeling of pure and utter unadulterated disappointment and confusion washes over you? Yeah? Well that's what I felt like. It wasn't that the muffins were bad, it's just that there seemed to be something missing. It didn't seem like a chocolate muffin. It had good texture and was moist, but there was very little chocolate flavour and it wasn't at all rich. The muffin really seemed to miss the flavour of the butter. Any chocolate flavour that could be found was heavily muted by the flavour of the blueberries. One of the few highlights of these muffins were the chocolate chips on top, which made eating the top part of the muffin nice and chocolatey. It offered the flavour that I had expected throughout but did not get. Besides the chocolate chips, the other standout was the cinnamon. If anything these muffins opened my eyes to the combination of chocolate and cinnamon. It is a fascinating and delicious pairing that I might start using in future chocolate ventures. Overall, my suggestion for these muffins would be to either keep the butter in the recipe to add flavour and make the muffins a little richer, or use the original amount of chocolate chips (1/4 cup) and add them directly to the batter. Either option would definitely help to elevate these muffins. Now obviously you could just do both, but if you only do one, I would suggest the chocolate chips. It's going to make the biggest difference. I'm going to say it again though, these muffins aren't bad, they're just not memorable. Nothing about them really stands out as great. 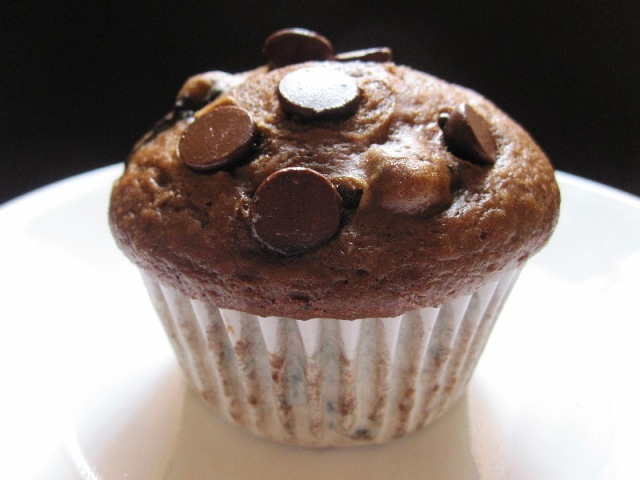 They boil down to the chocolate chips and cinnamon which does not a muffin make. They are the baking equivalent of “meh.” Though I suppose it's really my fault. Maybe this is just another indication that I should stop messing around with recipes so much and resolve myself to making them as they appear. Naaahh, that doesn't sound right :). Preheat oven to 350F and prepare a standard 12 cup muffin tin with paper liners or grease well(greasing would be my suggestion). In a medium bowl add flour, sugar, cocoa powder, baking powder, cinnamon, salt and whisk to combine. In a large bowl add milk, applesauce, egg and vanilla and mix until completely combined. Add dry ingredients to wet and mix until just combined. Fold in blueberries and chocolate chips if adding to the batter. Evenly distribute the batter in the prepared muffin tins and if you're not adding the chocolate chips to batter add 6 chocolate chips to the tops of each muffin. Bake for 20 to 25 minutes or until toothpick comes out clean (this took me 20 minutes). Allow to cool in pan on rack for 10 minutes before removing and serving. Maybe using mashed banana instead of applesauce would help and maybe some more cocoa powder? At least they were moist and the blueberries are healthy! Well, I've got to go and do some state fair posting-I haven't posted in a while! Yeah, banana is definitely an idea, it would change the flavour profile a bit, but not in a bad way :). I really think that just adding the chocolate chips would fix everything, though it would remove the "Low fat" in the title :). You should come to my house. I've got AMAZING chocolate muffins sitting on the counter. Zucchini, chocolate, chocolate chips, blueberries, and a couple of raspberries, because they were there. Seriously good. My advice? Don't worry about low fat. Been there, done that, and I got fatter. You know, the only difference between a cupcake and a muffin is the frosting. But muffin sounds "healthy." Have you ever seen Jim Gaffigan riffing on cake? It's hilarious! Look for it on YouTube. I've got a zucchini the size of a baseball bat right now, I could use another zucchini recipe :). And I'm not typically worried about low fat, but I like to do it when I can. Makes everyone feel better when they reach for seconds :). Buuuut.....I'm gonna have to disagree on the muffins vs cupcake thing, it's a little more than frosting. :) The sum total of a muffin/quick bread's leavening is chemical, either by baking powder or baking soda. Butter is added melted or oil is used, eggs are added lightly beaten, and everything is mixed together all at once until combined. This leads to the typical muffin crumb: dense, crumbly, almost bread like. A cupcake/cake on the other hand gets part of it's leavening from creaming the butter and sugar, then beating in each egg. This allows the maximum amount of air bubbles to be captured in the batter before the dry ingredients are added. It provides the cake the first stage of its leavening. It's why cake batter seems so much lighter than quick breads, and it's what gives cakes a light, airy and even crumb.